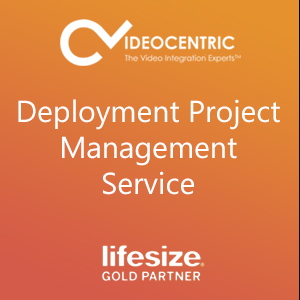 VideoCentric and Lifesize provide a number of implementation services so that you and your organisation can easily, quickly and effectively start down the path to success with your video, audio and web conferencing solution. The setup of new tools and technologies across an organisation requires advance planning for a smooth rollout and optimal usage. With the Deployment Project Management service, you can compliment your Lifesize Cloud solution with expert resources including a dedicated Project Manager & 8 weeks deployment management rollout, that will facilitate quick implementation and higher adoption rates. You may also be interested in the Lifesize Implementation Success Pro Service, providing a Customer Service Advocate for coordination of your deployment, without a dedicated Project Manager.